Armenia: In Yerevan, No Room Left for the Dead? A fascination with grandiose graves, built to show respect for the deceased and bestow honor on the bereaved, could mean that the Armenian capital of Yerevan, a city of over 1.1 million people, soon will run out of space to bury its dearly departed. Graves decorated with huge marble statues and sprawling family mausoleums abound in all of Yerevan’s 21 cemeteries, which now account for about 10 percent of the city’s total land area of 227 square kilometers, experts estimate. That proportion is twice the size of what the city can maintain, they say. “I myself have seen a grave occupying 260 square meters. If things go on like this, the capital city will become a cemetery one day,” continued Badalian, who now serves as Armenia’s ambassador to Turkmenistan. With Armenia’s death rate steadily increasing over the past decade (it stood at 8.49 per 1,000 people in 2012; the second highest in the Caucasus after Georgia), no one expects demand to slacken in the foreseeable future. Only four of Yerevan’s cemeteries (Ajapnyak, Shengavit, Spandarian and Arin-Berd) still have space available, according to the city’s Public Services Department. But since these cemeteries border on residential areas, room for expansion does not exist. Over 46 hectares of land are needed to build a new cemetery, and the city does not have it, one municipal employee noted. “If nothing changes, Yerevan will run out of burial spaces in 20 years,” predicted Razmik Harutyunian, an engineer with the city’s Public Services Department. For now, no change is in sight. The 2006 law restricted graves to 2.5 square meters and family plots to no more than 12.5 square meters, but those limitations have not been enforced. Instead, bribery appears to be flourishing. Depending on the cemetery’s location and the size of the desired plot, a grave can cost the dram-equivalent of a few thousand dollars, or run into the tens of thousands of dollars, according to families interviewed by EurasiaNet.org. 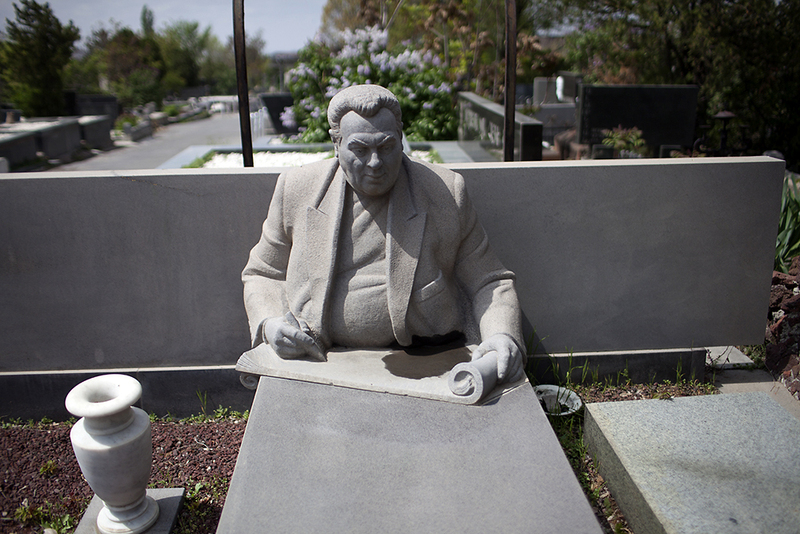 In 2008, Prime Minister Tigran Sarkisian spoke out on the issue, mentioning “a well-known chess player” who allegedly paid $2,000 in bribes to secure a grave for his father. “People are not ashamed of anything now,” the Azg daily reported Sarkisian as saying. Ironically, the prime minister himself is blamed for having contributed to the problem. Many Armenians argue that his decision to grant non-working days of commemoration for the dead for each of the Armenian Apostolic Church’s six major feast days has strengthened the country’s so-called “cult of the dead. ”On memorial days, Armenians take flowers and incense for their loved ones and packets of food and drink for the poor to cemeteries. The visits often expand into lavish, lengthy restaurant dinners – a custom throughout the Caucasus – to recollect the lives of the dead. Church services also are held. Others, though, reject criticism. “How to mourn our relatives comes from the soul and speaking about the amounts [spent] and the ways [we do that] is sacrilege,” asserted one 37-year-old male Yerevan inhabitant. Some are trying to promote cremation as a way to resolve the cemetery space issue. Twelve hectares of land were set aside for a crematory and columbarium in 2006, but construction is not expected to start until next year. The reasons for the delay are not clear. Some attribute it to opposition from the Armenian Apostolic Church. The Church, however, has not yet issued an official opinion. The Reverend Father Vahram Melikian, spokesperson at the Holy See of Etchmiadzin, the Church’s headquarters, commented, though, that the concept of cremation “is unacceptable from an Orthodox Christian perspective, and is alien to the Christian worldview” since it does not correspond with Christianity’s resurrection beliefs. Sociologist Aharon Adibekian, director of the Sociometer research center, does not see any connection between religion and Yerevan’s lack of a crematory. “[I]t is the factor of tradition that matters, and not religion,” Adibekian asserted. In the 1970s, plans also were made for a Yerevan crematory, but Armenia’s Communist Party never signed off on the structure. Ambassador Badalian hopes that, ultimately, Armenians will come to recognize the need to curb the country’s “cult of the dead.” But, as yet, no such awareness campaign exists.